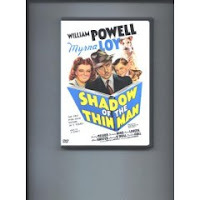 Another great one from the Thin Man series. This time Nick and Nora are investigating a murder at the race track. One of the jockeys has been shot and the assumption is he was killed because he did not throw the race like he was told to. Once the investigation begins two rival reporters, Paul Clark and Whitey Brown, are hot on the case. Paul uses his connections to get into the office of a bookie hoping that he can learn what happened. Unfortunately Brown has the same idea. The two end up fighting and Whitey ends up dead. Now Nick and Nora must prove that their friend Paul is innocent of murder. Once Nick figures out who the guilty party is he does his usual round up of suspects to unmask the killer. This was the fourth film in the Thin Man series and it does not disappoint. Myrna Loy and William Powell were again at their best as the husband and wife detective team of Nick and Nora Charles. Be on the look out for a young Donna Reed as Molly, Paul's girlfriend. Once again this series is wonderful and a definite must see.